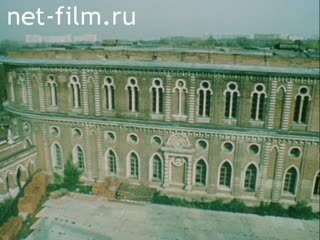 Script writers: Dmitriev A., Eremin G.
The film tells about the history and contemporary issues of the architectural complex "Tsarina". The ruins of one of the park pavilions. View of the Tower of Ruin. Overgrown with grass roofs Big Tsaritsyno palace. Ruined Pavilion, mischievous inscriptions on the wall. Detail of the palace wall. The branches of a bush. 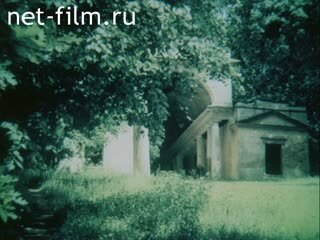 The ruins of the Grand Palace Tsaritsyno inside. View of the Church of the trees. View of the city across the river. Three-tiered bell tower and refectory. Regulation of the Council of Ministers. Meeting of the museum staff. Bread House Panorama, Arches, galleries and the Grand Palace in Tsaritsyno scaffolding. The big bridge through a ravine, at the foot of bridge construction equipment. Past the palace passing truck. The walls of the Grand Palace Tsaritsyno. Repair work on the big bridge. The plan of the park. The camera comes out of the trees to the Tower of Ruin. Types of Towers ruins from different angles. The branches of a tree on a background of water. Portrait of Catherine II. View of the pond. The palace walls and towers. Deed Catherine on the estate. Pages of the magazine "Russian Archives". Architect V.I.Bazhenov fragment family portrait. Decree of the Empress leave money to build. Historical reconstruction. Cultural heritage. Moskvovedenie. Museum-Reserve. The old manor. Masterpieces of architecture. Plan of black mud and the surrounding land. V.I.Bazhenov, a fragment of a family portrait. Design drawings of "Views of the village of Tsaritsyn." Candles on the background of the portrait. Plans and drawings VI Bazhenov Phillips Pavilion, Allen Pavilion, curly gates, Small Figured bridge. Fragments of figure ornament bridge. Portrait NINovikov brush Dmitry Levitsky. Portrait of Paul I in the costume of the Maltese Order Grand Master (author VLBorovikovsky). Portraits of Catherine II and Paul I.
V.I.Bazhenov, a fragment of a family portrait. Pages of archival materials, the decree of Catherine II. Drawing gazebo "Temple of Ceres." Plans and drawings of the pavilion "Milovidov." View of the pavilion from the trees. Autumn views of the park. A fragment of the central part of figure (Grape) wide. Catherine II on a walk in the Park (author VLBorovikovsky). Bread House: windows, fragments of walls. View of the Bread House. Sheets Album: Portrait of Paul I and Catherine II. Fragment decor Little Palace (emblem GMZ "Tsarina"). Fragment of ornament Bread House. Burning candles. V.I.Bazhenov, a fragment of a family portrait. View of the pond. V.I.Bazhenov, a fragment of a family portrait. The master plan of the estate, drawing M.F.Kazakova. Executive drawing Big Tsaritsyno palace. Autumn views of the park, dilapidated buildings. The camera runs along the walls of the palace. Paintings and watercolors Tsaritsyno park. Third Cavalry Corps in scaffolding. The walls of the body passes a meeting of museum staff. The general plan of the Tsarina. A collection of works by Faberge. The collection of Russian porcelain. The upper part of figure (Grape) wide. View of the dome of the Church of the trees. Portico of the Second Cavalry Building. On the avenue leaves a group of riders. On the shore there is a man with a dog. Riders go step on the edge of the alley. Luggage goes under the arches of the ruined palace. Hex roof of the pavilion.